Brad Keselowski passed Denny Hamlin with 2 laps left and went on to win the Brickyard 400 on Monday. It's his 2nd straight win of the 2018 season. INDIANAPOLIS — After three straight days of inclement weather kept NASCAR off the oval at Indianapolis Motor Speedway, the rain finally relented long enough to allow for the 25th running of the Brickyard 400. In front of a sparse crowd of around 10,000 fans after Sunday’s postponement, Brad Keselowski charged past Denny Hamlin Monday on a late restart to cross the yard of bricks first to earn his second win in two weeks and first in one of NASCAR’s premier races. He also won last weekend’s Southern 500 at Darlington Raceway. 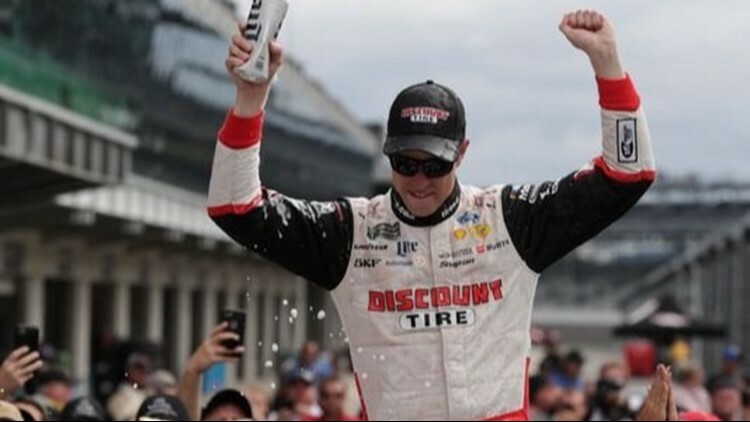 Keselowski’s victory in the Big Machine Vodka 400 at the Brickyard gives team owner Roger Penske, who has celebrated 17 Indianapolis 500 wins, his first Monster Energy NASCAR Cup Series win at the legendary race track. Penske can also claim additonal bragging rights after sweeping both races this year, following Will Power’s win in the 102nd Indy 500. "To get Roger Penske his first Cup car win here at The Brickyard is just an incredible feeling," Keselowski said in victory lane. "I'm so happy for everybody at Team Penske." Keselowski took advantage of fresher tires on a restart with three laps remaining to chase down Hamlin. The two banged doors as they motored around the backstretch before Keselowski was able shoot past the Joe Gibbs Racing driver on the front straightaway. "It's incredible," Keselowski said. "Last year I lost this race almost the exact same way, and to bring it home this way, it feels really good to make up for my messed up last year. Erik Jones finished second, Hamlin third, and Kevin Harvick fourth. Clint Bowyer, who took the opening stage, finished fifth. Matt Kenseth triumphed in Stage 2 and finished 12th. Two-time Brickyard 400 champion Kyle Busch finished eighth, but that was enough to clinch the regular-season championship. He enters next weekend's first playoff race at Las Vegas Motor Speedway as the No. 1 seed, as he tries to claim his second Cup Series championship. Harvick enters as the second seed and will also try to capture a second title. "I wouldn't say (winning the regular season title) gives us momentum but it sets us farther ahead," Busch said. "Any bonus points you pick up are good ones. All things considered we came out of here achieving what we needed to achieve." Meanwhile, the Brickyard wound up having little effect on the playoff picture. All 16 drivers who entered the day with a playoff bid cemented it, including seven-time series champion Jimmie Johnson and his Hendrick Motorsports teammate Alex Bowman. Both were guaranteed bids as long as a driver who hadn't already won a race this season won the Brickyard. That didn’t happen, so both Johnson, who finished 16th, and Bowman, who struggled home, 33rd clinched spots.